This red eared slider, named Fred by a former owner, came into our lives with a plea from my eldest son Sam when he was in 6th grade. A teacher at his school no longer wanted him and was looking for someone to take him off her hands. This teacher had taken Fred in from a student who decided that he was boring and was said to have dropped him out of a third story window, hoping that it would kill him! (wrinkles on his shell support this story). He survived. I was reluctant at first, knowing who would really be taking care of him. I went to see Fred and found him in an empty aquarium. No water, no gravel and no proper lighting. These turtles can only eat while in water so he must have been absolutely miserable. This was an unacceptable condition, close to torture and I decided on the spot to take Fred in. We got Fred to our house and immediately set about making a proper home for him. Gravel, a filtration system, proper lighting recommended for reptiles, a sun lamp and the right food were obtained. Fred took to his new surroundings immediately. He loves to sun himself on his "deck". The computer age finally came to our household with the arrival of this new fangled technology called electronic mail. We were having trouble deciding on an e-mail address. We did not want an address that needed a number after it. Alas, all names that we thought of had been taken and would have required a number. It is not clear who thought of it first. Fred's aquarium was right next to the computer. Someone suggested Fredturtle. Viola! It was an original name and it became our e-mail address since updated to Fredturtle42 to keep my GUSSOMO e-mail separate from the rest. Over the years Fred has been fairly healthy. 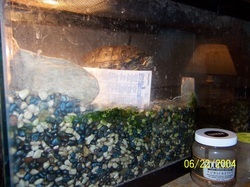 It was suggested that we give him some fish once in a while which is rich in calcium and good for his shell. So, he gets a silverside once a week, a sardine sized fish, head and all which I cut up into bite sized chunks. About five years ago Fred had an infection in one of his feet that caused a loss of a nail and weight loss. It also got into his bloodstream but with proper care he recovered nicely. Fred had an appointment a few weeks ago. His foot infection had returned, but not as severely. He gets a soaking in an antibiotic every other day. The real surprise came when the doctor mentioned that you can estimate the age of a Turtle by the ring patterns on their shells. She said Fred may be as old as 30 which is their average life expectancy in the wild. Then came this ugly opinion. Fred has some white markings on his shell which we thought were normal. The doc said no, this is scar tissue and the pattern is suggestive of a dog bite Poor Fred!! Not only was he dropped out of a window but he was attacked by a dog. The cruelty of some people is not to be believed. Fred is truly a survivor and it makes our whole family feel proud to have rescued him and cared for him all of these years. evidence of past abuse. There are more white marks not in view. One day an e-mail from Georgia Crackers manager Dave "Peach" Taylor, had a little fun with the Fredturtle name. He started referring to me as Fred Turtle. I good naturedly replied as Fred Turtle. It didn't take long for me to realize that I was on to something that could amuse and probably confound the rest of the league. Fred Turtle would become my alter-ego or perhaps an evil relative or part of a split personality. It then became obvious to me that Fred Turtle should officially become the new manager of The Chicago Mob. More feisty, less forgiving and no doubt, better at it. His aquarium was right next to the computer so he could easily manage! The only drawback is that Fred cannot work the computer or even roll dice due to the lack of opposable thumbs, so I am still required to do the physical play of the games. At right is Chicago Mob manager Fred Turtle during the 2004 season, discussing with reliever Rheal Cormier the possibility of him becoming the teams closer. Rhael was having an impressive year for Chicago with a 2.59 ERA , a 0.97 WHIP and ended up with 6 saves. Fred has been with us now for OVER 20 years. He has been relatively easy to take care of. 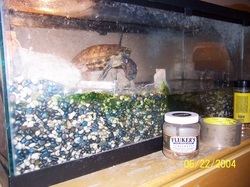 The filter in his tank needs to be cleaned every 3 to 4 days. Water is changed every 2 to 3 weeks and a complete scrubbing of his aquarium is done once in the spring and once in the fall. He eats mealworms and crickets, but not live ones. We tried that for a short while but the crickets would escape and the mealworms just sank to the bottom of the tank before Fred could get to them. He does follow you around when you are near the tank and walk back and forth or move an object in front of him. His favorite activity is definitely sunning himself when the heat lamp is on, craning his neck as far as it will go to get as close to the lamp as he can. It's an awesome sight. 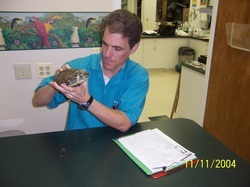 Above was team herpetologist Dr. Byron delaNavarre who served until 2007. Wouldn't you know that just half mile from where I work, there was a reptile specialist. He came in handy when Fred had some health issues that won't be discussed here. Fred needed minor surgery to correct the problem and a different kind of gravel was suggested. I did have to give Fred antibiotic's by injection. One never knows what one will be called on to do to help another! (You give the shot in the soft tissue between the neck and shoulder). Every team should have a team herpetologist. It is hard to judge the level of Fred's happiness. He is certainly in better conditions than when we adopted him. Still, he is confined to a 20 liter aquarium. Would he be happier in a nature center, or even set free? There are acres of development free wetlands surrounding us. There is even a turtle Xing sign posted as Algonquin road, a busy 4 lane highway crosses a low lying wetland area near our house. But no, he probably would not survive outdoors and after all these years, giving him to a nature center is out of the question. Fred is here to stay. He may be about 30 years old now but will likely outlive me. Besides, he makes one heck of a manager!